I’ve taken notes as I played the Illusion Maze in Inotia 3, and a floor by floor guide in solving the maze is posted in this page. I hope that this becomes a helpful Inotia 3 walkthrough. 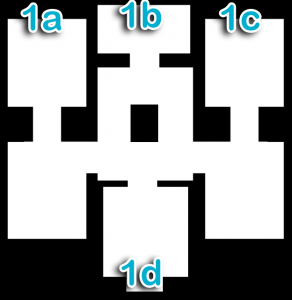 Screenshots or outlines of the Illusion Maze maps will be shown with labels like 1a, 1b, 2a, 2b, based on the current floor (number) and which passage (letter) it is , followed by guides where each passage will lead you and which passage is the one to take to advance to the next floor. So here we are at the first floor of the Illusion Map. Make sure your map is displayed so you can easily see the available passages, which are represented as green arrows by the maps. 1a and 1b leads to 1d, back to where you started. 1c leads to the next floor, 2F. 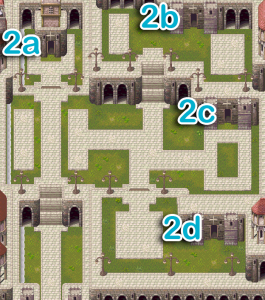 Note for this Illusion Maze floor: I’ll be referring to the spot where you first appeared on 2F as “starting point”. 2a, 2c, and 2d will return you to the starting point. 2b is the correct passage to take. It will take you to the next maze floor, which is the third. 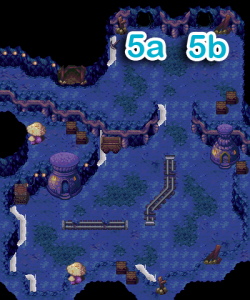 Note for this Illusion Maze floor: I’ll be referring to the spot where you first appeared on 3F as “starting point”. 3a, 3b, 3d lead back to the starting point. 3c leads you to the next floor: the 4th. Be careful on this Illusion Maze floor because one of them can take you back to the first floor! The same goes for the fifth floor. 4a will take you back to the 1st floor. 4b will take you to 4c (same floor). 4c is where you should go as it will take you to the 5th floor. There’s still another Illusion Maze floor after this, but this is actually the last maze (Hurray) and we only have two passages. 5a will lead you back to the first floor. So take 5b and be at the last level of the maze. At the center of the map you should beat the Apparition for a portal to appear and get yourself out of the Illusion Maze. I hope this walkthrough / guide helps at least one person in the world. lol. I am open to any corrections, so please just comment it if you have any. 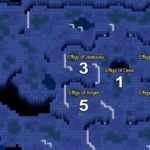 Click here to find where I got the game maps. Your walk-through was really helpful. Thank you. I would have been stuck forever, if not for you. So…. I got out fine, but however, it is still saying the quest is not complete. I am supposed to find Verat, and defeat him. If you have any information on this, can you please share it with me. Thank you. Hey Maritza. I hardly remember where *exactly* Verat can be found. I think there’s a passage North of the portal where you came from, after the Illusion Maze. I hope what I remember is correct and it helped you again. OMG! thank you! i was searching for the way out when i almost got so frustrated i almost wanted to bite my finger off! hahaha! THANKS MILLIONS! 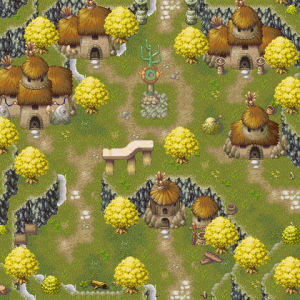 ola catzie sua postagem me ajudou muito mas depois disso tem um boss que nao da pra matar ele, tambem gostaria de saber se tem como eu voltar pra cidade pois tenho umas quest’s pra entregar, no mais muito obrigado pela atenção. Thnks for info, I’d never pass if it weren’t for you, btw, I’m trying to defeat the boss, I’m a level 40 arch Mage. I’m taking Amelia w/ me who’s level 39 , for third, should I take candance lev 39 , Ada level 38 , Juan level 37 , haldeit level 36 , or kuntu level 35 . Please help me decide, thanks. P.s. I have 5 large & 7 extra large hp potions, and about 10 resurrection scroll, and one resurrection prayer left, do I need more and how do I get more? I’m in the maze right now and idk how to get more. Thanks a lot… I was stuck at the 3rd floor for hours, and u saved me in seconds… Viva Catzie!